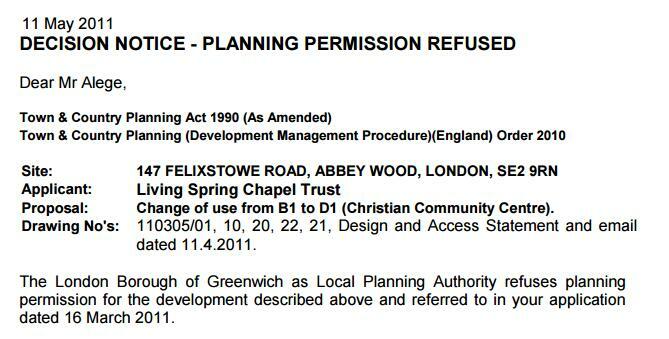 The sham that is Greenwich council's planning decisions – ignore and nothing happens? Since my last post on years of illegal uses at the site of a murder and triple stabbing in Abbey Wood, a few people have messaged me about how they’ve contacted the authorities for action to no avail, and I’ve also seen more information on just how long groups have ignored planning decisions, appeals, enforcements notices and it appears, even High Court injunctions. Curiously though, the police seem to have stated it was licensed. The BBC certainly reported that, and prominantly stated it was a ‘licensed party’. If true, it must be one of the most bizarre decisions I’ve seen in a very long time, and if so who granted it? Is this bad reporting, a misunderstanding from the police, or an incredibly flawed decision? As it would contravene at least four years of planning decisions and previous, continual examples of anti-social behaviour. Much of it very disruptive and dangerous. Back in March 2011 an application was made for a ‘community centre’ at the site. This came after units were used without permission for many years. The group applying stated themselves they were using it since 2004. I’m told this was causing existing businesses problems. Trying to get a delivery lorry in cannot be easy when dozens of cars are parked (often very badly) in the industrial estate and on approaching roads. Despite this being over four years ago, this unit has simply ignored the ruling ever since. They seem to even have a giant banner outside, making a mockery of the planning system and Greenwich council. Two years later and more applications came in, only to be refused. Again, the refusal was ignored, as was a failed appeal, and then enforcement notices served with no effect. After all this an injunction at the High Court was apparently served, only for the owners and tenants to ignore yet again with the chaotic, all night party at the weekend. The council were well aware of previous planning decisions and breaches. I’ve been told by people that have contacted the council regarding the years of hassle from the site. That’s why they went to the High Court, which is a serious step. So serious Greenwich council put out a press release about it a month before. But what good are endless paper notices when you can ignore at will, as has happened constantly? So after all these years of failed applications, ignored enforcement notices, court action, local residents and businesses putting up with a huge amount of grief, did someone really give a license for a party till 5am in a residential area with a history of problems? If so, just who and why? It negated years of decisions. It made the council look like fools and ignores all the issues many have had to suffer. The only time the police ever previously visited, as far as I can tell, they found serious safety breaches at an illegal event. This issue of ‘permitted’ really needs an answer. If it was, why? If it wasn’t, why was no action taken to close the site down long before now? This goes further than Abbey Wood. This affects the whole borough. What is stopping anyone ignoring planning rules and causing problems anywhere? Currently there is a planning application in for similar usage at an industrial estate in Charlton. The applicants state cars will park all along Anchor and Hope Lane. It wont just be on Sunday in all liklihood. And what about the long lorries that need access? 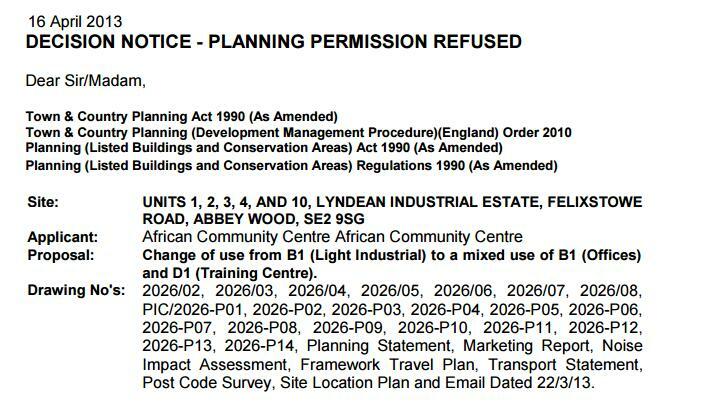 The council will probably refuse the plan, but given past history what will happen if the applicants just ignore and start (or continue) causing problems for businesses? The past doesn’t bode well. Greenwich council needs to change tact and begin working closely with the police, as currently its planning system is an optional joke. Anyway of finding out just who the applicants are? If they are a company, then the directors need to be named and shamed. “The Royal Borough of Greenwich has applied for an Injunction Order against Ogbuka Housing Limited and Others including Persons Unknown, being the other tenants and/or licensees and/or occupiers of Units 1, 2, 3, 4 and 10 Lyndean Industrial Estate, Felixstowe Road, Abbey Wood, London, SE2 9SG and other Persons Unknown attending church services and social events at those Units and parking on the verges and pavements in the neighbourhood. The Application is due to be heard at the Royal Courts of Justice, Strand, London, WC2A 2LL on Thursday 4 June 2015”. They don’t mention unit 14, but as shown above that was refused permission in 2011 and is still operating. I couldn’t find an appeal or subsequent application. But as a large industrial estate, there must be an owner of the entire site who is leasing units. They must be a reasonably large company, and what have they been doing? I’m surprised they havn’t sold up to housing developers given it is 2 minutes from Abbey Wood station with crossrail coming soon. The initial Cross Quarter masterplan included the site and stage 1 was supposed to have passive provision for its incorporation. I have a copy of the court order which was issued 5/6/2015 which names all who are responsible for the units. The only unit on Lyndean Industrial Estate that has any type of licence for the Sale or Supply of Alcohol; the Provision of Regulated Entertainment; and the Provision of Late Night Refreshment, according to Greenwich Council’s records, is Unit 13. Monday to Saturday from 08:00 hours until 22:00 hours; Sunday from 10:00 hours until 16:00 hours.